And here's the BEST thing about the co-challenge, there are TWO prizes and in entering, you automatically get two chances to win. How cool is that? 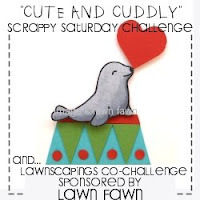 Lawnscaping is offering up Critters in the Forest as a prize this week and Wee Memories is being sponsored by Lawn Fawn and you can pick a set if you win over there. 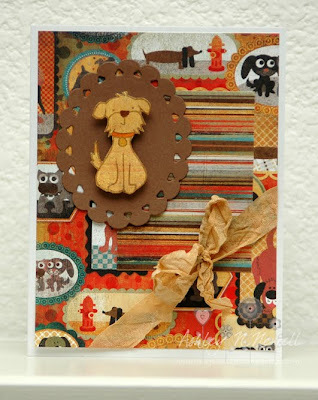 Here's my card for this challenge using this week's Mojo Monday sketch. Of course, I had to use my favorite doggy stamp for the Cute and Cuddly challenge. This little guy is from Critters in the Burbs. LOOOOOOOOOVE this card--I love how you take photos! They are the BEST! That seam binding is GORGEOUS--must remember that diags are our friend! And that I should try that sometime:) BEAUTIFUL! LOVE LOVE LOVE!! Such a sweet card! I love that Max & Whiskars paper. I have a couple sheets I've been hoarding since it came out! Lol. Love the diagonal strip of seam binding, too! This is so dog-gone cute (heheehe). I love your take on the challenge. Love this that paper is perfect for this stamp!! !